Micro Material Ltd’s 2017 nano-mechanical testing conference took place on 13th and 14th December 2017, kindly hosted by WMG (Warwick Manufacturing Group) at the University of Warwick in the UK. Fifty four participants from 8 countries attended the event, opened by Professor Barbara Shollock, Academic Director and Tata Steel Research Chair in Coatings at WMG, whose keynote presentation entitled “Nanomechanical testing for engineering applications” illustrated the importance of performing materials characterisation and analysis under test conditions that closely match those experienced in service – analysis which is greatly facilitated by the unique 1000°C capability of MML’s flagship nanoindenter instrument (the NanoTest Xtreme). Further talks were given by experts from leading European research institutes and universities covering topical themes in nano-mechanical testing, including microfracture, modelling, length-scale effects, novel test methods, high temperature testing and coatings. 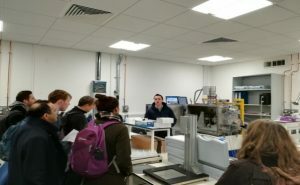 During the afternoon before the conference, attendees had also taken the opportunity to update their existing knowledge in workshop sessions with MML applications specialists and to tour WMG’s impressive laboratory facilities before enjoying a festive meal in the university’s superbly newly refurbished Radcliffe conference suite. If you use the NanoTest instrument already, are planning to do so or have a professional interest in the nano-mechanical characterisation of materials, why not join us for this year’s conference? Willow House, Yale Business Village, Ellice Way, Wrexham LL13 7YL UK.